NOTE: Pro-Ears MRI Safe Revo may not work for MRI procedures that require the use of a head coil (as used in brain scans), because the ear muffs may not fit inside the head coil. Before ordering this product, please discuss with the MRI scan center staff where you have your appointment, to determine if a head coil will be used and if so, if the ear muffs will fit inside the head coil. Pro-Ears MRI Safe Revo ear muffs will add approximately 13 centimeters to the width of your head. 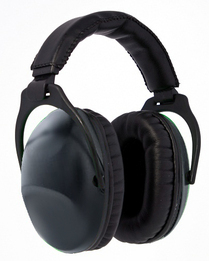 Pro-Ears MRI Safe Ultra Sleek are the thinnest MRI Safe ear muffs available (See and order below. Sleek will also fit babies up to average sized adults), so if Sleek muffs will not work, you will need to use ear plugs for your procedure instead. For scans not involving the head, Pro-Ears MRI Safe Revo ear muffs are a great choice. These hearing protection ear muffs for babies and children are an excellent choice for MRI patients to wear during loud and frightening MRI scans, offering just the right amount of hearing protection and a super comfortable fit. NRR 25. One of the best noise reduction ratings available anywhere in a hearing protector made for kids.